‘L‘iwi adult bird here. 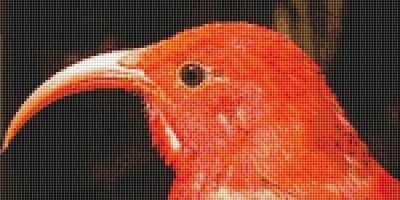 The ‘I’iwi is one of the Hawaiian honeycreeper species. They evolved in the forests of Hawai’i and are found nowhere else in the world. This bird was banded and released back to the forest. This chart is 150×75 stitches. It contains 48 colors. You’ll love the results though, this bird is amazing. You’ll need 2 skeins of 310 black, but less than 1/2 skein of all the other colors. Half of your purchase price is being donated to help save endangered species as well. Here is the original image used for this chart.